I am using a ULN2003 to power lamps and LEDs, and controlling them via 5v TTL. I have some LEDs can be driven by 5v, and some lamps which require 12v. Using the same ULN2003, can I have some powered with 5v, and some 12v, or do I need to use 2 different chips? Of course, the grounds would be shared. The ULN2003A does not have a power pin. 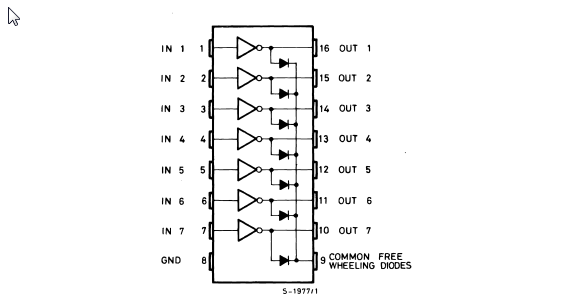 It has a catch diode pin that is common for all outputs. It can be connected to the highest voltage supply that has a load controlled by the ULN2003A. For example, if you have loads connected from ULN2003A outputs to +5V and to +12, connect the COMMON to +12. Of course each load will be connected between one ULN2003A output (OUT 1 ~ OUT 7) and the respective supply (either +5 or +12). In fact if your loads are resistive (and have short leads) you could probably leave the pin open, but it does no harm to connect it to the supply as indicated. Connecting it to +5 would be very bad as it could result in overvoltage (via the +12V loads) on the 5V supply, probably breaking something. Your schematic does not look right, but it's so messy I hesitate to delve into it on a relatively small screen. Not the answer you're looking for? Browse other questions tagged voltage uln2003 or ask your own question. What are all the multiple pins on PSU connectors for? How does a 24-pin MB connector work exactly? How does USB Power Delivery work with voltages above 5V without damaging 5V peripherals? Can I use batteries of different amperage?